This open plan chalet is located within a luxury alpine resort set amongst beautiful landscaped grounds. The Chalet is set in the back upper level with the best views and farthest from the road. 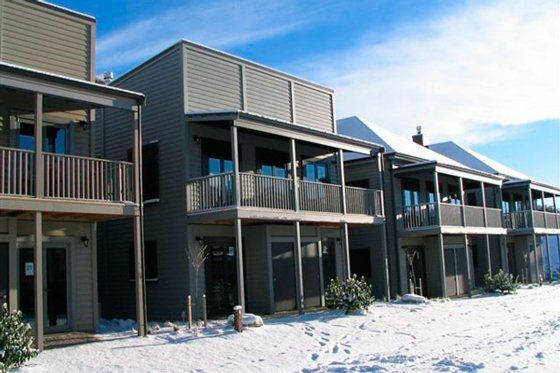 Located at the base of the Cardrona Alpine Resort and Snow Farm, a 15 minute drive from Wanaka and 45 minutes from Queenstown International Airport. Master bedroom features a king bed and ensuite. The second bedroom has a split king (can become 2 singles) and a third bedroom a comfy King Single bed and single trundler. Perfect for family! The chalet is equipped with full laundry and ski gear drying facilities. Guests have access to spa, swimming pool and barbecue facilities located within the complex. A two bedroom chalet is also available. Wifi limited to 120GB per month. Access to pool and spa. A great stay in a great location! We enjoyed our stay with our overseas visitors in this clean and comfortable villa - great beds, bathrooms, and balcony! We had a couple of issues - the TV not working and the gas bottle at the communal BBQ empty on one occasion when we went to use it. The accommodation is fully equipped and has got everything you need. The spa is a big bonus at the end of a skiing day, so is the proximity to the Cardrona hotel and the new little grocery shop. Perfect location. Clean and quiet. Only thing were the doors: all screeching loudly with every little movement. Easy to fix! Would always come back again. We will attend to the noisy doors asap. Easy fix! Thanks for your feedback.